Apple Pay vs Google Pay, A Honest Review. Technology has brought a revolution in almost every field today. Thanks to technology, you don’t have to carry cash on you today,and you can effortlessly make any transaction. This also involves not carrying many loyalty and credit cards bulging out of your wallet. This is because of the invention of the mobile wallets. With the mobile wallet, you just have to use your smartphone to pay for any transaction you might have and to top it all; these electronic wallets are free. To begin enjoying this payment method, you simply download the app on your smartphone then continue to add all your cards in the app. After this, all you have to do when you get to a payment terminal is get your smartphone out and pay effortlessly. Many of these apps like Apple Pay, Samsung Pay and Google Pay are becoming popular and compatible with many banks, credit cards and merchant card readers. Apple Pay and Google Pay are two of the most popular mobile wallets and while they deliver the same services, they are different in specific ways. Credit card fraud is one of the top worries that mobile payment users have. Banks and retailers are working tirelessly to upgrade their platforms and mobile payments have not been left behind. Both Apple Pay and Google Pay have taken serious steps in ensuring their users are safe anytime they are shopping. One major difference that the consumer can see is the use of TouchID in Apple Pay as compared to PIN Authentification in Google Pay. Apple uses tokenization where the card details are provided to the device. It then directly contacts the issuing bank and upon confirmation, it receives a card specific token called the Device Account Number that is stored on a secure chip on the device. Google, on the other hand, adopts an intermediary role and saves your card on their secure servers. They then issue a virtual card to your device such that the vendor never sees your real card when you are doing your transactions. When your virtual card is charged by sellers, Google then charges your stored card. This seems like a tiny distinction, but it makes all the difference. Google acts as an intermediary and stores all your cards on their secure servers. This way, they don’t have to worry about making any deals with the bank and you can add any card to your Google Pay. Google is going a long way to try and replicate a real wallet in the virtual world. They do this so much that they even track your transactions and saves order details making it seem like you stuffed the receipt in your wallet. Apple explicitly declares that they will never track your transactions. Apple doesn’t even store card details on their servers like Google or on their devices. Apple is a pure intermediary and it just transmits your card to the bank and authenticates with the bank then receives and stores the DAN number sent by the bank. Apple Pay which was released a year earlier than Google Pay has seen formidable growth and it is a major competitor to Google Pay which was released January 2018. The only advantage Google Pay has over Apple Pay is it is compatible with thousands of devices all running on Android OS. This is as opposed to Apple Pay which is available to the latest Apple devices running on the latest iOS. This means Google Pay has the chance to grow and reach a broader market as compared to Apple Pay. Remember Google Pay is a combination of the old Android Pay and Google Wallet. This means it is not an entirely new app but it is a new platform,but it has users. The users only have to update their Google Wallet app on Play Store and get the new Google Pay with combined functions. •	Like we have mentioned above, Google Pay is a pretty new app,and some of the features like paying directly on apps and websites are limited. – With Apple Pay,however, you can make in-app purchases easily,and you can also send and receive money from friends. 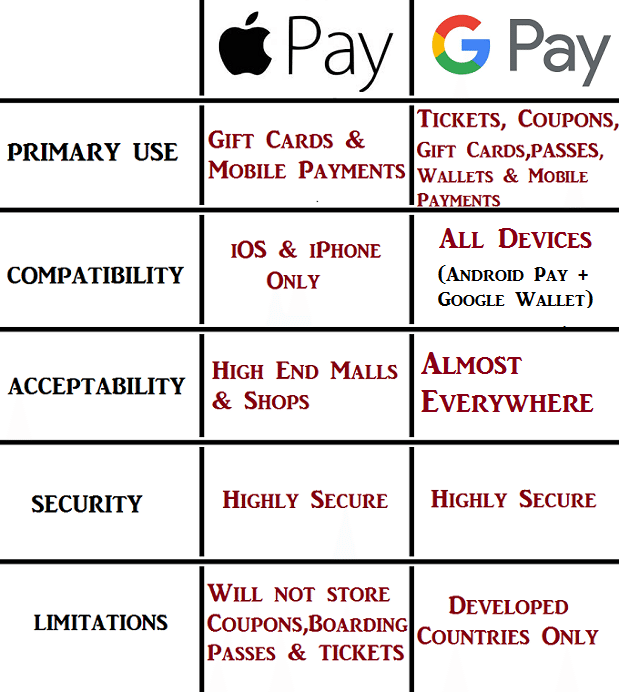 •	Google Pay is the answer to Apple Pay Cash. – With this, Google says that users in the US and UK for starters will be able to send and receive money using Google Pay Send just like Apple Pay users send and receive cash using Apple Pay Cash. Before you choose the best mobile payment system to use, it is good to do a little research and see the one that is likely to favor you the most and which one is more likely to lock you out.